New York, New York, so good they named it twice, is one of the major cities in the world and also one of the top tourist destinations in America. Also known affectionately as the 'Big Apple' and lying next to both the Atlantic Ocean and the start of the Hudson River, the lively and bustling metropolis of New York city is full of interesting sights and major landmarks. There are five main boroughs of New York, with Manhattan forming the heart of the city and its thriving tourism scene. The remaining areas are the Bronx, Brooklyn, Queens and State Island, all of which have their own character and are well connected by subway trains. Located within the Manhattan district and covering an enormous area of almost 345 hectares / 850 acres, Central Park provides a wonderful green space and is where you will find the Dairy Building (65th Street pathway) and its useful tourist information center. On Broadway, the Times Square Visitors Center is also of note, as is the New York Convention and Visitors Bureau on Seventh Avenue at 53rd Street. Accommodation in New York can be a little expensive, although if you are flexible and organised, then there will certainly be a large number of excellent hotels to choose from. Booking ahead is strongly recommended and many of the New York hotels are filled to capacity during the summer and winter. Weekend reservations at hotels can also be necessary several weeks in advance. Consider staying in Lower and Upper Manhattan, Chelsea and Midtown, while dining out in neighborhoods such as Chinatown, Little Italy, Soho and Tribeca. If hotels in the heart of the city prove beyond your budget, there are still plenty of excellent options and affordable beds to be found in the center of Manhattan and Brooklyn. Hostels offer both cheap dorm beds and private rooms to all types of traveler looking to explore the sights and sounds of the city on a shoestring. Of note, most youth hostels will require proof that you are actually traveling and will likely ask to see either your passport, flight ticket or hostel card. 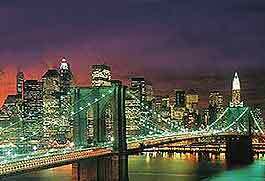 Many of New York's major tourist attractions are known and loved throughout the world. The most visited and photographed include the Empire State Building - one of the most famous of all the city's landmarks and the definitive skyscraper; the Chrysler Building - opened in 1930, when it was declared the world's tallest building until the completion of the Empire State Building; Times Square - situated in the heart of the Theater District and filled with colorful neon signs; Brooklyn Bridge - an iconic structure, ranking amongst the most beautiful bridges in the world; and of course the impressive and enormous Statue of Liberty - symbolizing the American dream of freedom. The sheer size of the Statue of Liberty is quite simply breathtaking. 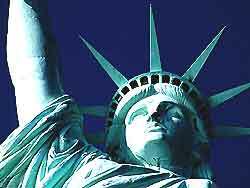 More information about New York Tourist Attractions. There are many city museums, providing a wide range of interesting information about the history of this ultimate tourist Mecca, such as the Museum of the City of New York on Fifth Avenue, which houses an enormous amount of city memorabilia and information. New York also has its fair share of top art galleries, exhibiting a multitude of works of art from local and international artists, such as the John McEnroe Art Gallery, the Frick Collection, the Whitney Museum of American Art, and the Guggenheim Museum, the latter of which has become known for its striking contemporary architecture and views across Central Park. New York has an excellent transport system, including the underground Subway trains, which connect the many districts and provide an inexpensive and convenient way to travel. There are also around 4,000 buses plying the streets, accompanied by numerous legendary yellow taxi cabs, which can be easily hailed and have become widely associated with the city. 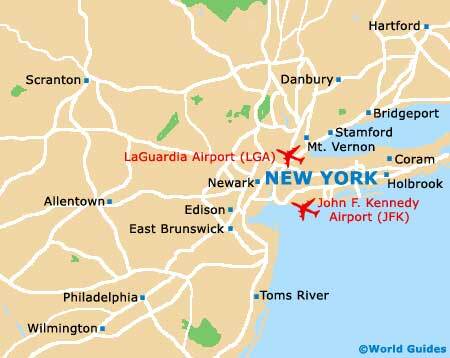 There are three main airports that serve the city and provide an array of New York flights - the famous John F. Kennedy International Airport (JFK), La Guardia Airport (LGA) and Newark Liberty International Airport (EWR). New York is a strong city and this is clearly apparent after suffering one of the worst terrorist attacks in the world on September 11th, 2001, when the Twin Towers of the World Trade Center were destroyed. New Yorker's have gradually rebuilt their lives, showing the world that this is a resilient city and that the Big Apple will always be one of the greatest and most important cities in the world.